When a new television series arrives with the “Bad Robot” logo stamped onto the credits, the expectations are sky high. After all, “Bad Robot” is the production company of movie and television mogul J.J. Abrams, the creative visionary who launched “Lost” and “Fringe”, directed the outstanding “Super 8”, re-vitalized “Star Trek”, and is taking over the franchise helm of “Star Wars”. So when “Revolution” premiered last fall on NBC, it had a lot to prove. Anchored by a charismatic cast and an irresistible high-concept premise, the show started out promising enough. But after the crushing disappointment of Amblin Entertainment’s “Terra Nova” and the disastrous NBC misfire “The Event”, genre fans were cautious. As season one progressed, “Revolution” picked up story momentum, began to develop a core of great characters the audience came to care about, and even develop an intriguing mysterious conspiracy. In short, the show kept getting better and better. Revolution ended year one looking very much like it would be the next great network genre series. 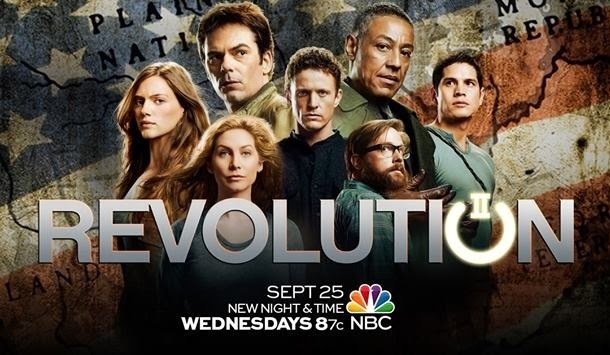 Four episodes into year two “Revolution” has continued to develop into one of the most exciting and entertaining shows on television. The addition of veteran actor Stephen Collins an excellent pick-up. The pacing of the first three episodes has been brilliant. Not since “24’ have we seen a dramatic series so effectively milk very drop of excitement out of the action adventure format. Everything about the show from the fight choreography to Christopher Lennertz score keeps getting better. But the key to any dramatic series is the characters. We have to care to keep coming back each week. There is one particular character who had been the key to “Revolution’s” continued improvement. Every show, especially every “Bad Robot” production, has that one special character who makes it all work. “Lost” had the enigmatic John Locke played by Terry O’Quinn. “Fringe” had the eccentric Walter Bishop played by John Noble. “Revolution” has the super scientist action hero Rachel Matheson played by Elizabeth Mitchell. One of the weaknesses of “Revolution” during the first half of season one was the criminal underuse of the effervescent Elizabeth Mitchell and her head strong character. Once the producers and writers realized this and brought her into the forefront of the action, the “Lost” protégé began to find its focus. Elizabeth Mitchell is a pleasure to watch. She owns the screen every time she is on it. The luminous actress brings a quiet, but fiery intensity to her brooding character. As season two begins to unfold, Mitchell’s Rachel Matheson is the truly the key to unlocking the secrets of the pre-power failure past, as well as a spark of hope for a post-dystopian future. Every event, every character connects back to her. Bottom line: “Revolution” will most likely be in a “Fringe” like life and death struggle to stay on the air, thanks to NBC’s inane decision to stick it in the Wednesday night 8 PM time slot with almost no promotion. It deserves better. This is a great show with a fantastic cast. It is well written, breathlessly paced, addictive, entertaining, and jam-packed with pulpy thrills.